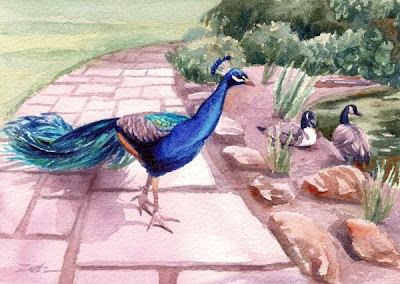 Peacocks are such beautiful majestic birds with their iridescent colors and incredible tails. Even when the tail is not held high and fanned out, it is regally swept along behind the bird like a royal train. They even have a little "crown" on their heads! This peacock along with a few wild geese are enjoying the sunshine in Kew Gardens in London.